Thanks for the kind words Trent! I actually kicked things off tonight with a brief stint at North Hill (wanted to test the waters) before getting serious after thanksgiving. I'll be at the December 1st and 15th from 6-8pm for the Free Thursday night wine tasting events at Taylor's BP in North Raleigh. I'm also playing on December 11th at the Tucker House in downtown Raleigh as part of the Oakwood Candlelight Tour. I also have a few other events but they are private parties! If you see me, say hello! I have my first Holiday Gig! They will have free tea and cocoa tasting with live Christmas music (Me playing Christmas Carols on my Trombone)! So glad that you will be back to this venue again this year. Unfortunately, we won't be able to see you as we will be out of town. Bummer ... But hope to catch you somewhere during the season! Have fun! Were you at North Hills today? There was a guy there playing the trombone and I wondered it if was you but I didn't want him to stop playing long enough for me to ask. He told me Merry Christmas after I tipped him though. Yes! That was me. I was at North Hills from 12:30-2:30 today. I'm off work all week and playing as much as I can (while the weather is still nice). I've really enjoyed playing at North Hills this year and have met a lot of great people there. Thank you very much for the tip and hope you have a Merry Christmas!! NRG glad it was you Reader Girl saw. 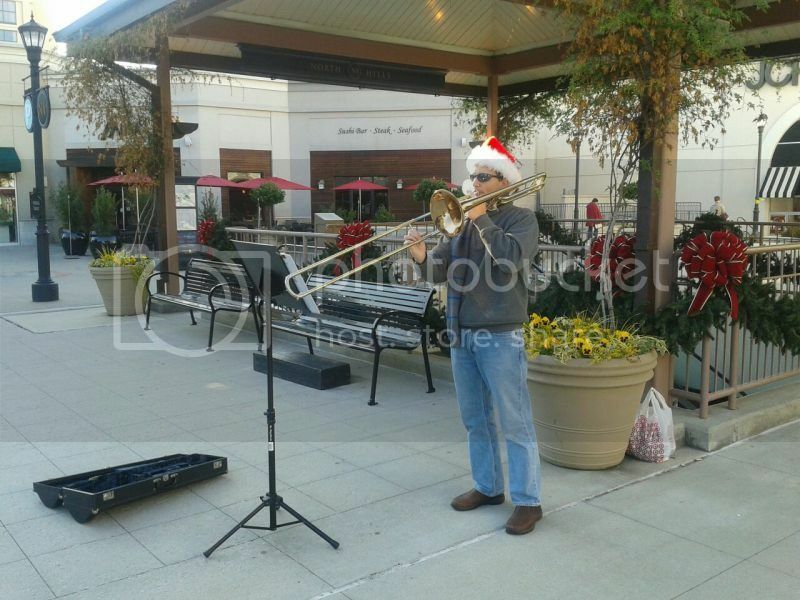 Twice in the past 2 years I have gone up to trombone players and said "Hi Are you North Raleigh Guy?" only to have the guy look at me like I was crazy. You need to wear some coded sign, like a pin or belt or something so your CD buddies can identify you. Glad you are keeping busy so you can drink all that beer you love. Wahoo! Next time I see you, I will introduce myself so you don't worry about that really tall, scrawny girl with glasses who keeps staring at you like she knows you..... My bf loves Christmas music but he didn't get to hear you yesterday so I may drag him over to listen, too. It is cool you have seen so many trombone players. Where are you bumping into them? Maybe I need to send you a pic of me playing so you will recognize me when I am out playing next year! That is cool. Small world! I *hope* I can play at North Hills at least one more time before the holiday, but this weather isn't cooperating! Are you trying to track down a Trombone Trio! If you see somebody that looks like this guy playing feel free to stop him and say hello. It's me!